The increasing demand for economical, space-saving and intelligent gas sensor systems enabled the development of an electronic nose at the Forschungszentrum Karlsruhe. The application areas range from air quality monitoring to medical breath analysis to firing tool control. The core element of the KAMINA (Karlsruhe Micro Nose) is a gas sensor micro-array, which includes 38 sensor elements on a 4 x 8mm2 area. The basis of the array is a 150nm thick SnO2 or WO3 layer, whose electrical conductivity has a very high sensitivity to the ambient atmosphere. The basic micro-array structure is developed using RF-magnetron sputtering, by the application of a shadow masking technique. Sputtering of parallel platinum strip electrodes is performed atop the metal oxide, subdividing it into the initially identical sensor elements. For modifying the gas response of individual sensor segments, a gas-permeable SiO2 membrane, with around 2 to 10nm thickness variation was deposited across the device using ion beam assisted deposition. Figure 1 illustrates the structure. Over each sensor segment, the silicon dioxide gradient causes a varying gas response. The detector’s ability to differentiate gases depends on the shape and steepness of the gradient membrane. In order to increase the temperature to its operating range, 250-350 °C, heater elements are fitted to the reverse side of the substrate. It is also possible to deploy the heaters to produce a 50 °C temperature gradient across the device. The way in which the oxide layer thickness changes with respect to its position over the device, is a critical factor in its functioning. 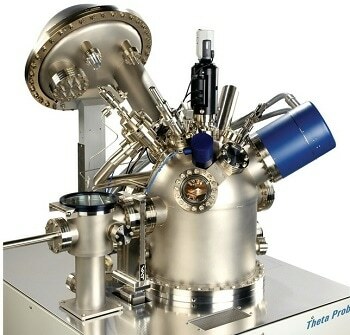 Measurements can be performed using angle resolved X-ray electron spectroscopy (ARXPS) as the thickness is up to a few nanometers. In an ideal scenario, a thickness line scan experiment must be performed. 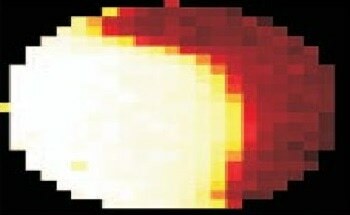 This kind of experiment is very normal for the Thermo Scientific Theta Probe. The mounting of the complete sensor device was performed on the standard sample holder and loaded into the Theta Probe for analysis. The device in the analysis position is shown in Figure 2. The optical images show the sample overview as in Figure 3 and a close-up view of the analysis area is shown in Figure 4. A zoom camera and microscope aligned exactly with the analysis position are used to obtain the images. A feature of interest is aligned with the source and the focal points of the analyzer using a graticule seen on these images. The graticule’s inner circle is 50µm diameter and the outer ring is 1mm diameter. With the help of the optical views, the start and end points of the line scan were chosen. Across the sample, two linescans were defined, one in which the analysis positions were above the SnO2 channels between the electrodes and one where the analysis positions were above the Pt electrodes. The length of each linescan was 7mm. From 38 points, data were obtained. The microfocus monochromator was set to 50µm to specify the area from which collection of data took place. Parallel angle resolved XPS spectra were obtained from the Pt 4f, Si 2p, Sn 3d, C 1s and O 1s regions. The 60° angular range available from the Theta Probe was divided into 16 channels. Certain materials in this specimen are insulating and hence charge compensation was needed for obtaining satisfactory ARXPS data. Peak fitting was applied to each spectrum using the Avantage data system, at each angle and each position in the line scan. One of the O 1s spectra fitted with the components SiO2 and SnO2 is shown in Figure 5. 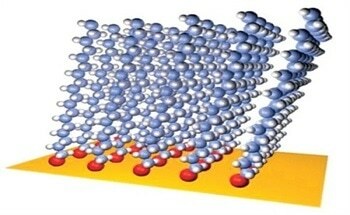 The normal technique of determining the overlayer film thickness of one material on another substrate is based on the intensity ratio of the two XPS signals of the overlayer and the substrate, respectively. It also depends on the assumption of an exponential depth distribution function for the signals. The fitted peaks were used for generating the thickness plots.